Please refer to our stock # 5.23 when inquiring. This piece is 28"x22". Helen LaFrance is a self-taught, modern, contemporary artist who is 99 years of age. Her earliest known painting is a 12’x20’ mural inside of a local church that was made circa the late 40's and early 50’s and she continued to paint into the early 2000's. LaFrance’s work is represented in many notable public and private collections in this country and in Europe. These collections include those of Oprah Winfrey, Gayle King, Bryant Gumbel, and contemporary artist Red Grooms. 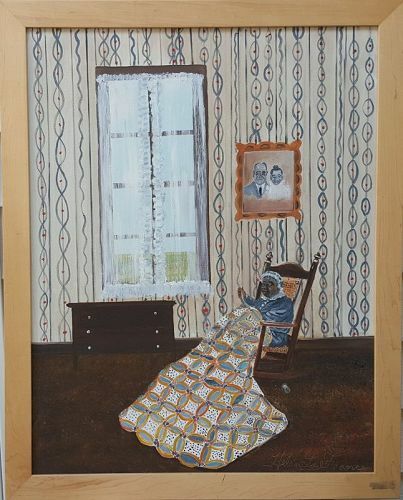 Helen has not only painted most of her life but she is also a master wood-carver and quilt-maker and now it is time for her to find her place in American Art history. You can see more from her at http://helenlafrance.com or by contacting Shelton Gallery. You can now buy this painting with Art Money, a service we offer our most valued clients. Art Money will give you a 10 month, interest free loan of up to $50,000 so you can buy the art you love.